Imagine standing at the edge of a forest, and that you want to reach the other side. Would you walk a straight line through it? Or, might the path meander in every possible direction, around boulders, between trees, along a stream, feeding the deer, conversing with the owls, and roasting marshmallows? Yeah, every possible direction, because this is how things are in a forest. Yeah, okay. I’m doing my best–so don’t laugh! And I seem to be meandering around a few boulders in the forest of life this year in general and this week most recently, but as my grandmother used to say “little by little” progress is made. So T-minus 4 days to take off! The next move is in 4 days and some final cleaning took place here in the kitchen yesterday and the skin on my fingertips are a bit raw to prove it. Never have gotten used to cleaning using rubber gloves. Clumsy and too much time taking them on an off as I’m pulled in other directions while cleaning–take answering the phone for one example. Where is the ultimate destination? I don’t know! But I’m willing to let that be okay. I’ve located a number of possible paths and applied for the hiking permit (so-to-speak, speaking symbolically) and we’ll see what opens up. My trip to the rental office yesterday was productive in that I was able to tie up the loose ends and end the confusion about final notices and paperwork: there was a change of staff right in the midst of the apartment change. (Long story–don’t ask.) All’s well that ends well and I’m ending my association with this particular apartment about as well as I can do it. So on to the next adventure, around this boulder here in 4 days. Maybe then I will see more clearly what’s ahead. I think sometimes my vision is blocked for good reason–perhaps I’m being spared in some way and that’s a blessing. For clarity sake, the boulder represents the current move into the new apartment with my sister. What is beyond that? At least for the near future–this is my question. Near future representing let us say the next 6 months. So here we go… asking for just one card, just to get a feel for the energy beyond the T-minus 4 days…. Well, it’s the 7 of Swords. Well first thing I get here is “confrontations being avoided” — and that may be a good thing. 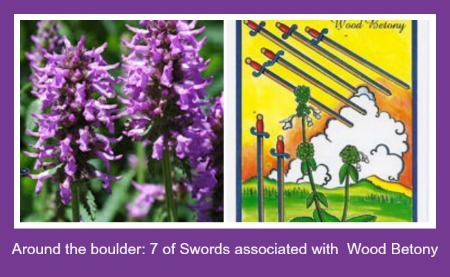 The herb associated with this card is WOOD BETONY which some wear to avoid evil spirits. That’s a bit dramatic. Let’s just say that Wood Betony can help one release fearful visions of the future… that I’ll go with. It helps with one’s nerves when used medicinally. There’s some reference to hidden intentions and deceptions. Sounds like honesty all around will be important on the other side of this boulder. This card involves “keeping something to yourself” and being a loner–like those blackbirds who keep to themselves and bow and then fly away when they see other birds. (Just this past week many blackbirds have been coming to the feeder–highly unusual) Blackbirds stay to them selves so much that it is said when you actually see two blackbirds together at once, it’s a good omen. So this “keeping to one’s self” sounds like blackbird medicine advice. This card is also about preferring solitude–and that of course is no secret about me. This will likely not change is what the card is indicating. This card involves “separation from others”. And further, this card relates to self-reliance and using one’s own wits to solve problems and resources. Boy O boy! The feeling that I’m getting here is that my life won’t really change all that much from what it is now. That “loner” and “self-reliant” energy that I carry (that blackbird energy) will not change. That’s a comfort to me. This card also carries a meaning that relates to “running away” in some way—and that has to do with confrontations being avoided in this case (or so it feels). There’s a testy teenager who will be part of the household and since this card applies to my question about what is around the corner for me, the avoidance of confrontations (bow and fly away; blackbird energy) may be what this card indicates. (Astrologically speaking: If you’re an astrologer, this girl is a Leo Moon and Aries Sun with Saturn (in Aries) in the 7th, Virgo rising–3rd house Pluto. My Sun and Moon are in her 1st house within orb of her Chiron. Her Moon is on my 12th house Mars/Pluto/Saturn stellium. My sister is an very early Leo Sun and Aquarius Moon affecting her daughter’s 5th House Uranus.) Yeah, that 7 of Swords and Blackbird loner stuff …. probably good advice. A big message of the 7 of Swords has to do with the need to be calm and to keep things to yourself–I so get that. 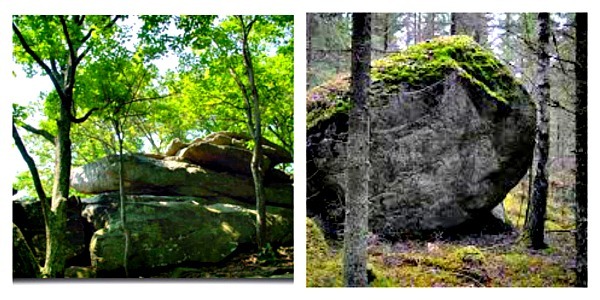 I may re-evaluate my plans or goals once I get on the other side of the boulder too but meanwhile, I will meander just as I have been through the forest of life and enjoy whatever is beyond the boulder or around the curve in the path. Meanwhile, I will do my best to hold to my Bodhisattva vows and the 37 Practices. This includes practice the “six perfections”: giving, moral discipline, patience, effort, concentration and wisdom in order to attain enlightenment for the sake of all beings.